Definition - What does Standing Spinal Twist Pose B mean? Standing spinal twist pose B is a standing yoga posture in which both feet are planted on the ground about hip width apart, but with one leg crossed in front of the other. The arms extend out to a T shape with the hands at shoulder height and the hips remain facing the front while the torso and upper body rotates towards the front leg. This is a useful posture in yoga for stimulating the spine and abdominal area. 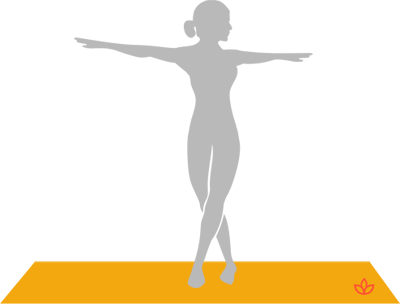 It is a relatively simple and accessible standing twist, although the balance may be slightly more challenging than in standing spinal twist pose A due to the cross of the feet. Standing twists are also said to be good for detoxification and weight loss. They are particularly good for those with sedentary jobs to get the spine moving again. Standing spinal twist pose B should be avoided during pregnancy, or for those with a hernia or any spinal disc injuries. This posture may be practiced as part of the standing postures section of a gentle yoga practice.